Anya, center, goes underwater to show off a check from the Phoenix Suns Charities for a grant the Valley of the Sun JCC received for its Jeff Berkowitz Youth Basketball League. Joining Anya are Squad 2 boys swim team members Veer, left, and Jack, right. 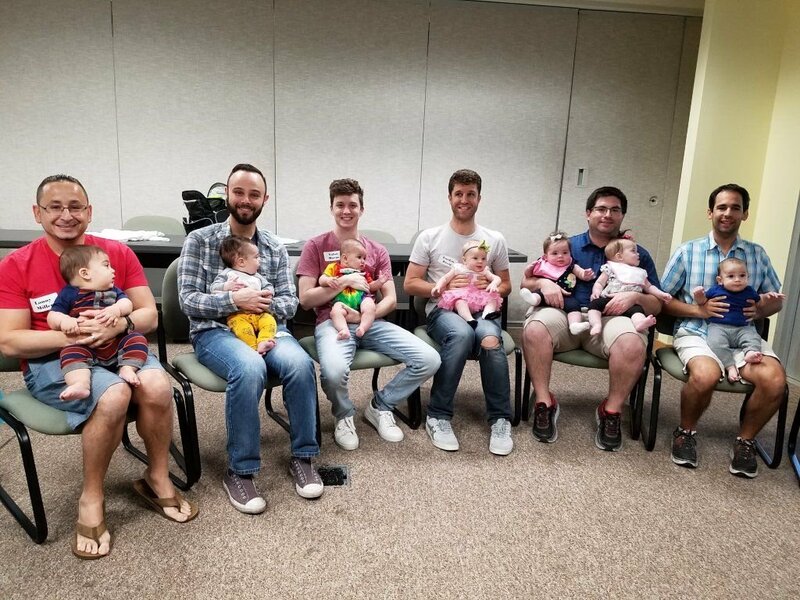 Dads and babies gather on Oct. 7 for a reunion of parents who took part in the Bureau of Jewish Education’s Jewish Baby University. Brahm Resnick, center, anchor of 12 News’ ‘Sunday Square Off,’ visits Temple Chai, where he spoke to the Dor L’ Dor Seniors group regarding election issues facing Arizonans. Pictured with Resnick are program organizers Sandra Kane, left, and Joe Newman. Valley Beit Midrash opens its 2018-2019 lecture season with Rabbi Laura Geller, rabbi emerita of Temple Emanuel of Beverly Hills. Geller was the first woman to lead a major metropolitan synagogue as a senior rabbi. Members of the Jewish Community Foundation of Greater Phoenix’s Youth Philanthropy Board meet for a day-long retreat. These high school students will be working as strategic grant makers to address food insecurity in Phoenix and Israel.